The Idaho Foodbank Mobile Pantry parked outside FMHC’s Emerald Clinic on Tuesday, August 15th. Staff from both organizations worked to serve close to 100 households (488 individuals). National Health Center Week (August 13-19) is a time to educate the public about that value Community Health Centers (CHCs) bring to the populations they serve. For 50 years, CHCs have delivered comprehensive, high-quality, cost effective, and accessible care to all patients, regardless of their ability to pay. In 2016, Family Medicine Health Center (FMHC), operated by Family Medicine Residency of Idaho, delivered care to 19,255 patients, providing translation services for 51 different languages, in six outpatient clinics in Boise, Meridian, and Kuna. Providers at FMHC screen all patients for social determinants of health, one of which is food insecurity. Food insecurity can increase the risk of developin g a chronic disease, prevent effective chronic disease management, increase the likelihood of hospitalization, and result in poorer patient outcomes and higher treatment costs. Based on the most recent Map the Meal Gap study, 14% of Idaho’s residents had food insecurities; 232,180 people or 1 in 7. Of these 232,180 people, 29.4% are ineligible for any public assistance and must rely on the private charity network, such as The Idaho Foodbank and its partners. 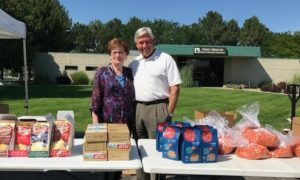 This year, during National Health Center Week, FMHC and The Idaho Foodbank worked together to improve both the awareness of our community about the issue of food insecurity in Idaho and the overall health of our community.